It’s festival time, season of indeterminate noodles, oxygen bars and trenchfoot. Now I’ve got nothing against such gatherings. I’ve been to my fair share (even written about one particularly muddy one). But what I’m talking about is decidedly more, er, indoors. This coming week sees the start of Hay Festival (where mud is decidedly on the cards), which is the spiritual home of all things bookish. So what better time to talk about why it’s a really good idea for writers to make it a resolution to go to at least one event at one festival this year. Of course, the fact that I have a words and music show, The New Libertines, that will be performed at Stoke Newington Literary Festival on June 4th and Oxfringe on June 13th is by the by. OK, before I start, in the light of the piece I’ve written alongside Cat for this month’s Words With Jam about the event NOT The Oxford Literary Festival, I should come clean. There are lots of things about literary festivals I’m not keen on. The big ones especially. The line-ups are pretty much all the same – whoever’s got a new book or a new TV series out does a talk about it, some of them even in conversation with Melvyn Bragg. They sign copies and move on to the next one. Local authors and experimental writing rarely get a look in. And they are corporate beyond belief with their impromptu Blackwell’s store and their official festival whisky. But the fact remains that every writer should go to a big festival at least once, even if it’s just for one event. Though if you can afford it, I would recommend going for the day, because the milling around between events and soaking up the atmosphere is not only invigorating (and good for celeb-spotting) but an important part of starting to breathe the air, feeling what it’s like to be a writer (taking a cue from Rebecca’s excellent piece a few days ago). Which is reason one. The second reason is similar – depending on your viewpoint you will get to see either what the future might hold or what might be expected of you. This is especially important if you fall into the latter camp – if you see the publicity side of things as a real drawback of wanting to be a writer. Find an author you really like. Go and listen to them speak. Analyse how you feel – excited, interested, a little nervous in a good way at seeing them in the flesh (yes, quite possibly cold and wet and wondering when you can have a hot cup of Bovril but we’ll forget that for the moment). Then store that away in your memory banks, and remind yourself that when it’s you up there, that’s exactly how your audience will be feeling – it’s the first part of seeing audiences not as something intimidating but as a really exciting friend. Third, even if they’re going on to say the same thing ten more times in ten more places, this is still plain and simple a great chance to see one of your heroes. I run Not The Oxford Literary Festival, a counterculture gathering during the Oxford literary Festival set up directly in opposition to its overpriced facelessness. But last year I still went along to see Patti Smith read from Just Kids, got her to sign the book, got goosebumps from being that close to one of my greatest idols. Fourth, if and when you feel less overwhelmed by the surroundings and less like oh-my-golly-I’m-only-little-me (which may be after you’ve been to a few events, after a few glasses of Official Festival Whisky, or the moment you pitch up at the car park if you’re a shameless self-publicist), festivals are great places to meet people. I don’t just mean people who might give you a contract – yes, the literary world is full of tales of writers who met their agent at a festival bar, and yes about 5% of these may be true and not just the hazy recollections of heavy duty beer goggles, but there are far more tales of agents running for cover and telling their friends never to have anything to do with that pushy little oik over there. I mean people who love what you love. And, of course, in this day and age, people you know off twitter. It’s a place for starting and cementing friendships. Fifth and finally for now, try to go to a smaller, less well-known festival. A local one is great because you can meet the bookstore owners you may very soon be asking to stock your self-published book, you can get to be part of the local literary community, you may even get asked to speak next year. The programmes can also be more diverse. You can get to find whole new seams of literature you never knew were there, see people doing things in ways you’d never thought of. They can be truly inspirational. I’m particularly looking forward to Stoke Newington this year. After our show I’m hightailing it across Church Street to see one of my student crushes, Louise Wener from Sleeper, and the whole weekend has an Edgar Alan Poe-ish feel to it, which will make for a marvellous atmosphere. So, dust off your metaphorical wellies, start googling and browsing programmes, and make this the summer you head to your first festival. And see you all in Stokey! Dan Holloway is the author of Oxford based thriller The Company of Fellows, the novels Songs from the Other Side of the Wall and The Man Who Painted Agnieszka’s Shoes, and the collection (life:) razorblades included. He is happiest behind a microphone and will be appearing at festivals and fringes across the UK this summer. You are wearing a label, whether you know it or not, and everyone can see it. What label did you pick? Unpublished Writer? Writer-To-Be? Did you even choose your own, or did you just accept one that someone else handed out? Maybe it no longer fits, but you wear it anyway, because it’s familiar, it doesn’t make you stand out from your peers, and nobody is offended by it. It is safe. The idea of throwing aside a worn out old label and designing your own may be a little fear-inducing, but what if you gave it a go? For a long while, ‘Author’ seemed out of my emotional price range. Even ‘writer’ stretched the wallet a bit. I wanted to give myself the aroma of that label though, the scent of future success, so I took the word that seemed furthest from my budget – ‘Author’ – and formatted it into an off-the-peg arrangement that I could wear: ‘Author-In-Waiting’. If you cannot afford a Gucci outfit, you can still own a little of their magic. You can buy their perfume. For a long time before the reality arrives, you can smell of the dream. The same is true of writing dreams. One day, I put aside my ‘Author-In-Waiting’ ensemble and picked up the expensive designer bottle, labelled ‘Writer’. Something changed. Other people started to take me more seriously, because I started to take myself more seriously. Instead of passively waiting for success to come to me, I wore my label and made it happen. Once you wear a label, your subconscious battles away to make the outside and inside versions of you match. That happens whether or not the label is positive. If you continually label yourself as something ‘in waiting’, you are always waiting. If your label is ‘unpublished’, guess what? You will stay that way. The scary thing about choosing your own label is that it is a public declaration of intent. Once you have done it, you can never go back. Oscar Wilde said: ‘I find it harder and harder every day to live up to my blue china.’ Wilde’s blue china was an outward symbol of the Aesthetic Movement. For you, the symbol of being a published author might be a physical book. Label yourself, and grab a symbol of that. Call yourself an author, then get your book printed – even if you print only one copy. Put it in a place where you cannot avoid looking at it. Make it your blue china, and work every day to live up to it. Just a quick post to apologise to anyone who has submitted a short story or article proposal recently. Lots of people seem quite keen for inclusion recently (I wonder why? ), but it means we're fairly behind with reading and replying. We promise to get back to you all shortly. At the beginning of April, I visited the 'Not the Oxford Literary Festival'. 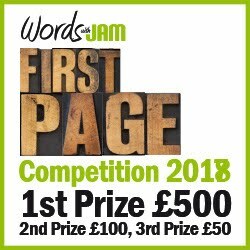 You can read all about it in the June edition of Words with Jam. But I went not least because I was hoping to persuade the very talented performance poets and story tellers there to do some podcasts for us. Well, here is the first of those. Helen Smith is the author of Alison Wonderland, Being Light and The Miracle Inspector. In this podcast, she tells her very funny story, 'Aubergine', in which something very strange is happening to Claire. Could it be connected to her age? Or the face she's a woman? Or is she experiencing more than a general feeling of malaise. On a mezzanine floor above the café at Dance East in Ipswich, in a space that is more used to hosting a small reading group, it’s standing room only. Perched on a bar stool in order to be seen over the heads of the crowd, is Amanda Hodgkinson, there to promote her first novel: 22 Britannia Road. With her shoulder length blonde hair and yellow cardigan, Amanda looks elegant as a flower. And she answers questions in a calm, warm voice as if she has been doing this all her life. No one in the audience would guess that this is her first major promotional event for her book. But then this is her home crowd. Amanda, though she now lives in France, grew up in these parts. She talks about how she had imagined her move to France. “I would be sitting on the terrace, sipping wine as the words flowed.” The reality was very different. “The house we bought had no floor, no kitchen. It had running water, but not always where you wanted it to run.” Instead of sipping wine on the terrace she was learning to lay floors and fit kitchens. The result is a wonderful, lyrical novel that explores what is means for a small family to have been separated by a war, to have undergone terrible experiences and have secrets from one another – and then to have to pick up the threads of their lives again after the war. The main characters are, like many others in East Anglia, Polish. The father fought with the Polish arm of the RAF; the wife and son are refugees, traced to Red Cross camp after the War. Amanda reads us two passages: one from the opening of the book, where Sylvana and her son Aurek board the boat that will take them to England, and one where an increasingly frustrated Janusz insists on taking their troubled, almost feral son to the doctor. She reads beautifully, expressively, in a way that is sure to charm audiences. Has she had any feedback from the Polish community? Not really. Not yet. But then someone from the audience pipes up. A mother and daughter. The mother is Polish. Like Sylvana, she survived the War in extreme poverty. Like Sylvana, she came to Ipswich after the War and settled. They haven’t read the book yet, but from what Amanda has said tonight, yes, that is what it was like. Amanda beams with pleasure and tells them she hopes they will enjoy the book. Unusually for a first novel, 22 Britannia Road has already been sold around the world. It is being translated into French, German, Romanian... the list goes on. It is already published in both Australia and North America. And Amanda is about to leave on a tour of Indy bookshops in the US. If tonight’s performance is anything to go by, she is going to knock 'em dead. 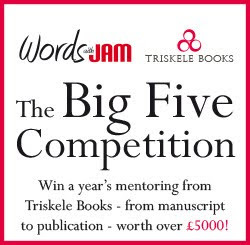 The time has come to announce Words With JAM's latest ridiculously generous competition. This time we want you to bring joy to the world, a smile to the lips of men and women everywhere and, most importantly, make us snort coffee from our nostrils. Yep, this one's all about giggles, grins, chortles and sniggers. One scene, any format - as many spontaneous laughs as you can create. It's about time you funny buggers got a look in, we reckon.